It was the night the lights went out in Portland. 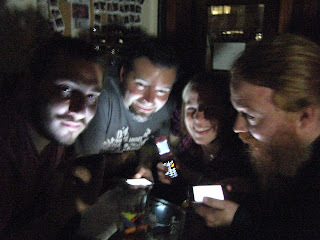 When the Pub Nighters moved from Bridgeport to the Rogue Public House last night, we found a startlingly dark bar, the result of a blown transformer somewhere in the Pearl. 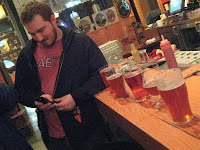 Probably not what Rogue had in mind for the Portland debut of their Chateau Wet Hop fresh-hop ale. Due to the darkness, I didn't have to show my Rogue identification papers to receive a 75-cent discount on my shaker pint. It still cost me $5 -- Pow! That hurt after the $4.25 imperial pints of Hop Harvest at Bridgeport. That's an SPE of $16.11 for Bridgeport vs. $24 for Rogue -- but not as bad as the $27.60 SPE that Rogue would charge to undocumented drinkers in its territory. But the best SPE for us last night was at Deschutes, where some lucky timing and mistaken identity got us our beers on the house (we did tip the bartenders handsomely). Deschutes had the same power outage as Rogue. The lights came back on just as we arrived, but they had already decided to close for the night and make sure everything was back on track after the outage. We blurted out that we were there for the Hop Trip, and for some reason that got us ushered into the bar with a company sales rep, who told the bartenders to set us up. The Hop Trip was quite good, but it turned out they also had fresh-hopped Mirror Pond and fresh-hopped Hop Henge (!) both on cask. Oh my goodness. The fresh-hopped Mirror Pond is as good as it was last year; I have to proclaim it the new Fresh Hop Champion. Amazingly fresh flowery flavor, on top of the just right pale ale body. The fresh Hop Henge was also fabulously good, big and chewy, and hoppy of course, but without the almost gritty hoppiness of some of the Hop Henge experiments. No one I talked to last night -- the Pub Night gang, plus Beer Advocates Josh and Sean that I ran into -- was very impressed with the 2009 Bridgeport Hop Harvest, but for me it was exactly what I'm looking for in a fresh-hop ale. I'd compare it to this year's Full Sail Lupulin, which I consider to be one of the best. There's kind of a honeyed quality to the best fresh-hop beers, that isn't entirely due to the malt. Contrast that with the Rogue Chateau Wet Hop, where the fresh hops didn't really bring anything noticeable to the flavor. I've got to hand it to Charles and his iPhone. I was totally unprepared for a Pearl pub crawl, and I didn't have the Beer Mapping Project codes in my phone for anyplace but Deschutes. Thanks, buddy. My obsessive need to update my twitter map would have driven me insane. Don't miss out on the fresh-hop Mirror Pond and Hop Henge at Deschutes. It's a wonderful experience. Fresh-Hopped Mirror Pond was one of my favorites to roll out of the harvest-season last year and I'm happy to see it back and proclaimed as tasty as ever. Definitely on the docket for this weekend.